It might be my competitive nature, but I have always been the person who likes doing things... that I'm good at. All of that changed last year when I started yoga. Even though I felt horribly out of shape and inflexible when I started, I kept going back. In every way possible, it was the best decision to continue, even though I wasn't good at it. This is a deep twist! That's my right arm wrapped around my left leg. You try it. I had never tried Crane before, but I was determined! I am still at the very beginning of this yoga journey, but I fully intend to stick with it. Moral of the story: Do something you're not good at. Open your mind, be brave, go it a fair go, and you'll surprise yourself. P.S. Happy 85th birthday to my Grandma Cristina! I love you! Way to go & try something new! Those poses look tough, especially crane! Whenever I saw one of these pics all I could think is YOU ARE SO BENDY. It's true. Also, your arms are killer. Holy moly I am beyond impressed with every single pose! Look at you go girl!!!!! I'm so impressed with you challenging yourself!! You're AMAZING! I've been following your Instagram pics and it always makes me want to get back into it. Loved seeing this challenge of yours! I am MOST impressed with your crane. What. a. beast. Awesome! 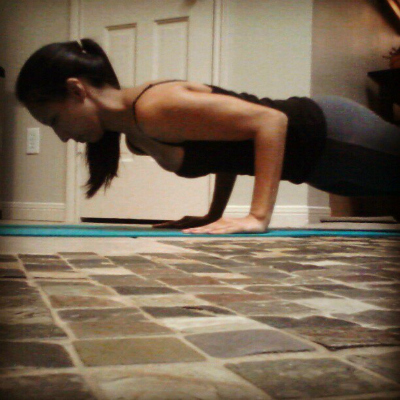 I love yoga and used to do it regularly, but have fallen out of my routine schedule. This is inspiring for me and gets me motivated to start again! Thanks for the inspiration today Linds! So proud of you on your journey...your form is lookin' great btw! 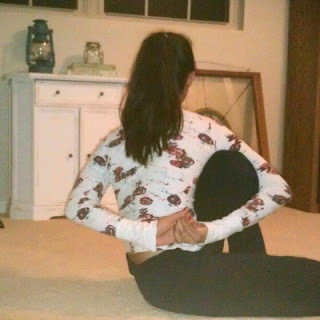 I am so impressed by the beauty of your yoga poses, especially crane! I am hoping to get that one someday - still have not been able to. Also impressed by your reverse half moon. I struggle with that (and half moon, OMG such a struggle). I still can't believe you've only been doing yoga for a little over a year. You're amazing at it!